For some nonprofits, the date of the auction gala is determined after careful examination of a single individual’s calendar. This well-regarded person doesn’t (usually) work for the organization, yet still holds enormous influence over the timing of the nonprofit’s largest fundraising event. Dates are checked and re-checked. Venues are called and called again to confirm availability. Currently I have clients in Miami, Los Angeles, Boston, and D.C. working with honorees. 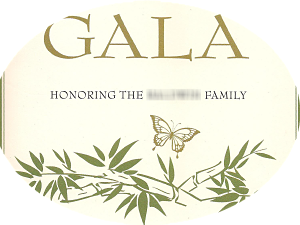 If you’ve honored someone of prominence at your gala, you – like they – already know that some are trickier to work with than others. If your honoree holds national or international prominence, scheduling really presents a challenge. On the flip side, when done properly honoring someone supports audience development. This can make any other headaches worth it. Here are seven ideas on how to share your gala honoree on Facebook, your blog, and other mediums to maximize the exposure your nonprofit receives via the relationship. Give the obvious: Tell us about him. Who is he? Why is he important to your organization? What has he done that’s so special? Recall memories: Ask people to share their favorite recollection of the honoree. For instance, at an event earlier this year, the honoree was well-known to members of the school as a former administrator. Some tales are made for sharing. Ask for gift ideas: Stumped on a plaque inscription? Wondering if you should present him something in addition to handing him a certificate for his wall? Share your dilemma and ask followers to make suggestions on what they think would be a good thank you gift. Throwback Thursday: Post a photo of a younger version of the honoree. Ask if anyone can identify him. Blast from the past: If you have an honoree every year, share a special moment involving your honoree from last year’s event. Do you perform skits of the honoree, as one client likes to do? Do you show a video? These posts will help prep your guests as to what makes your evening special. Got other creative ideas? Share them below.